Sometimes the box office is not a good indicator of a film’s quality, and such is the case with Valerian and the City of a Thousand Planets. The movie’s aesthetic is a satisfyingly conscious blend of space opera, fantasy, and action with a European flare. Throw in deep-seated government corruption that leads to planetary and species genocide, and the core of the film adds in a substantive message about dignity, self-respect, and trust. The plot is straightforward. Valerian (Dane DeHaan, The Amazing Spider-Man 2, Life, A Cure for Wellness) and Laureline (professional model Cara Delevingne, Paper Towns, Suicide Squad) are inter-planetarian government agents, working for the World State Federation. They are tasked with recovering a “converter,” an animal that ingests energy-intensive pearls harvested from the waters the planet Mul and creates new ones. The converter is the last known living specimen of its species because its home planet was destroyed by debris falling from a massive space battle above its planet. The government wants the converter to help contain an “infected” area of Alpha, a massive space station that houses millions of beings representing thousands of species. When Valerian and Laureline retrieve the converter, the officer responsible for the eliminating the threat to the space station, Commander Filett (Clive Owen, The Closer, Duplicity, Hemingway & Gelhorn), attempts to take possession of the animal. Valerian refuses, tasking Laureline with protecting it while he provides security for Filett. Thinking Filett possesses both the pearl and the converter, a lost band of humanoid aliens from Mul track him down during a meeting of Alpha’s leadership council. The humanoids disable the council members and guards, including Valerian, and seize Filett. Valerian pursues the humanoids in an attempt to rescue Filett, ordering Laureline to stay behind to report to the president of the Federation and follow him. The government is unsure of Valerian and Laureline’s loyalties, and their suspicions heighten as the two agents discover holes in Filett’s story about the contaminated zone, learn more about the the beings that kidnapped him, and uncover the truth about the destruction of Mul. Ultimately, the chase leads to a climactic confrontation between the kidnapping humanoids, those responsible for destroying their planet, and the armies intent on destroying the perceived threat to Alpha. The chase and search for Filett is a visually pleasing romp through different planetary worlds, the dangers they pose, and the wonders they reveal. The film’s title, however, is misleading, suggesting the story centers on the male lead. French writer-director Luc Besson (The Fifth Element, Lucy, Leon: The Professional) has given his major characters clearly defined arcs that maintain tension throughout the movie, making the film closer to a male-female buddy cop film than a heroic solo effort by its male lead. Indeed, Laureline is a much more layered character and more interesting as a result. Valerian is the archetypal brash but talented alpha male. He is a bit older and experienced, despite his boyish looks, holding the rank of major in the human police force. His partner Laureline is younger and of lower military rank, but she’s smart, witty, and equally well trained. They are equals in terms of the story, although each has strengths and weaknesses that play off the other. In a decidedly non-American twist that could well throw American audiences off, Valerian proposes marriage to Laureline early in the film. She refuses him because of his philandering ways, establishing a level of emotional maturity that becomes central to their relationship and the tension it creates throughout the movie. Valerian features a slew of well-known performers in significant and minor roles, including pop music icon Rihanna as the shape-shifting cabaret-style entertainer named Bubble, Ethan Hawke (Training Day, Magnificent Seven, Boyhood) as a pirate, jazz legend Herbie Hancock as the defense minister, Rutger Hauer (Escape from Sobibor, Sin City, Batman Begins) as the president of the World State Federation, popular Chinese actor Kris Wu, and John Goodman (Raising Arizona, Monsters, Inc., Patriots Day) as the voice of the galaxy’s most wanted criminal, Igon Siruss. Valerian is surprisingly successful in exploring values and attitudes crucial to building community through interpersonal bonds, particularly faith, forgiveness, and love. These relationships give the characters a welcome degree of depth in a genre better known for special effects than human sophistication. The remnants of the alien race from Mul, for example, know that humans were responsible for the destruction of their planet and 6 million souls. Yet they forgive the humans and do not allow bitterness, anger, and the overwhelming loss of family to become the seed for retribution and revenge. They recognize that communities flourish on peace, not war. The Mul humanoids are also androgynous although they still exhibit typical male and female physical features. This choice might seem like a nod to contemporary debates over gender roles. But the aliens’ mutual affection and respect for their partners serves the story as a direct contrast to the confusing, antagonistic, and adversarial relationship between Valerian and Laureline. This conflict runs throughout the movie and even becomes critical when Laureline forces Valerian to choose between his loyalty to the government and his trust in her. Unfortunately, Valerian and the City of a Thousand Planets continues the frustrating tradition in sci-fi fantasy films of ignoring economic and commercial interactions. Despite the fact Alpha exists by virtue of its role as an interplanetary trading center, nothing in the film even touches on how this is accomplished other than off-handed references to species “sharing” information and technology. This omission is unfortunate because infusing more economic sophistication into the plot and backstory would significantly raise the stakes if Alpha were destroyed. Voluntary exchange and repeated peaceful trade creates trust and establishes intimate bonds between radically different cultures, enabling the growth of a City of a Thousand Planets in the same way that hundreds of neighborhoods knit metropolitan areas together in a regional economy. Nevertheless, Valerian and the City of a Thousand Planets is an enjoyable space opera, a visual romp through exotic worlds and continuous encounters with diverse species. 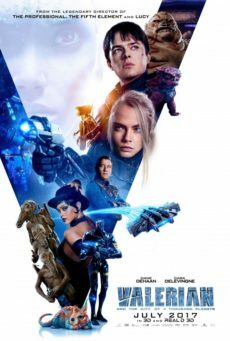 The pace is uneven, dragging in some parts, and the banter between Valerian and Laureline at times seems juvenile and forced, but the movie entertains, fits well within its genre, and delivers a refreshing level of depth.